Hoodies are a tried-and-true American tradition, which provide comfort and warmth in cool-to-chilly fall and winter weather. Slipping the hood over your head provides a cocoon-like feeling when bracing the elements, whether it’s a child’s Saturday soccer game, Friday night high school football, an early morning fishing trip out on the lake, or a challenging day’s work for the outdoor day laborer. Hoodies may have gained a reputation in some walks of life, but just slip one on and you’ll see exactly why people from all walks of life embrace the comfort of the hoodie in crisp outdoor weather. The first thing to decide is what type of hoodie you prefer. There are different material densities for different weather, from light hoodies to heavy duty. 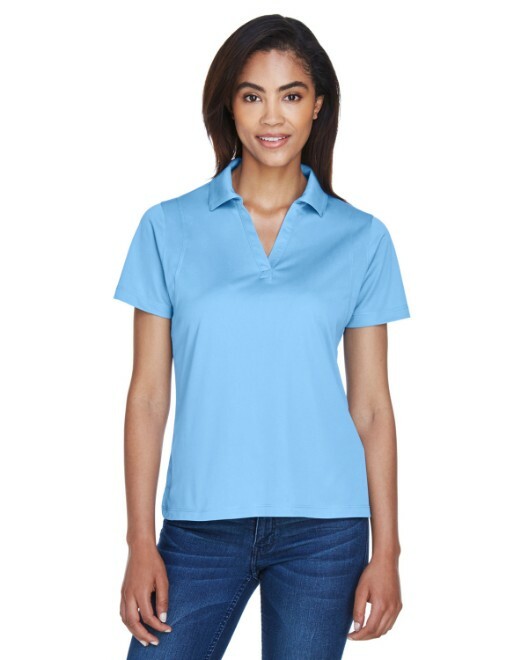 Our weights range from 7.75 ounces, such as the classic Gildan G185, to the comfortable 12-ounce Champion S1051, and everything in between such as the Gildan G125 9.3-ounce 50/50 cotton/poly blend for all occasions. We even feature lightweight hoodies for warmer seasons, which still have chilly nights. Imagine a breezy evening on the beach in September, where the sun is setting and you are kept warm with a bonfire and a Canvas 3512 4.2-ounce long sleeve jersey hoodie. 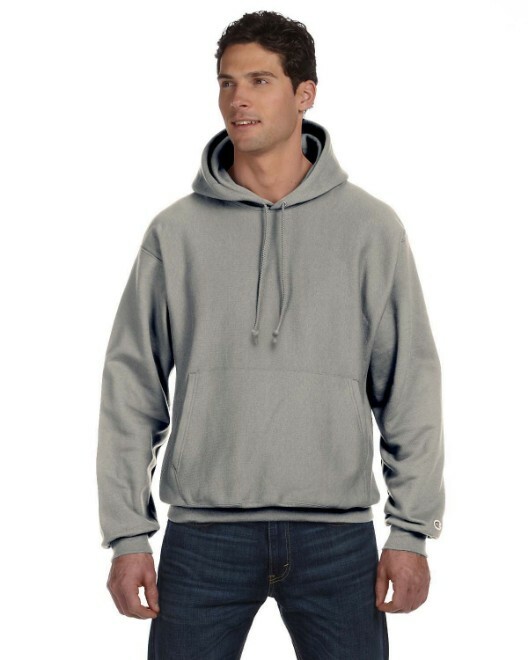 There are also different styles, the main one being a solid hoodie versus a zip-up. This is a stylistic choice, but it is also important to note that zip-ups give you more control over warmth, so in warmer weather, the zip-up may be the way to go. 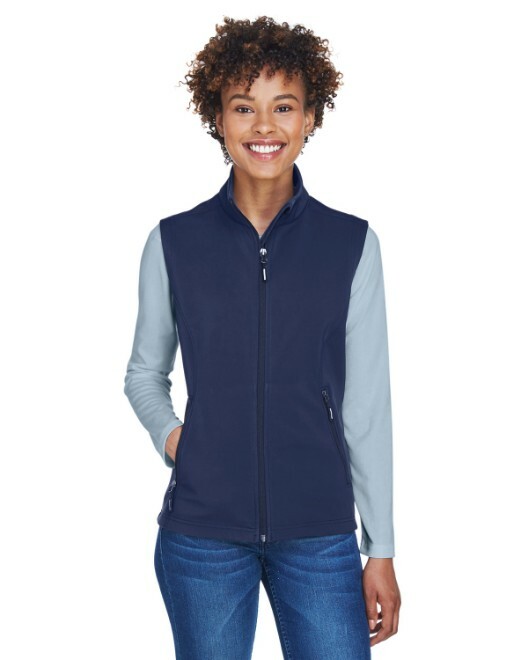 A zip-up also creates an interesting design when the zipper splits the graphic on the front, something to consider when creating the design for your apparel. Another interesting option to consider is the eco-option. What makes a hoodie eco-friendly? Well for example, we have the Alternative AA1970 Eco Long-Sleeve Zip-up Hoodie. This piece is made from recycled poly, organic cotton, and Rayon. Rayon is a manufactured fiber composed of regenerated cellulose, derived from wood pulp, cotton linters or other vegetable matter, with a soft hand. 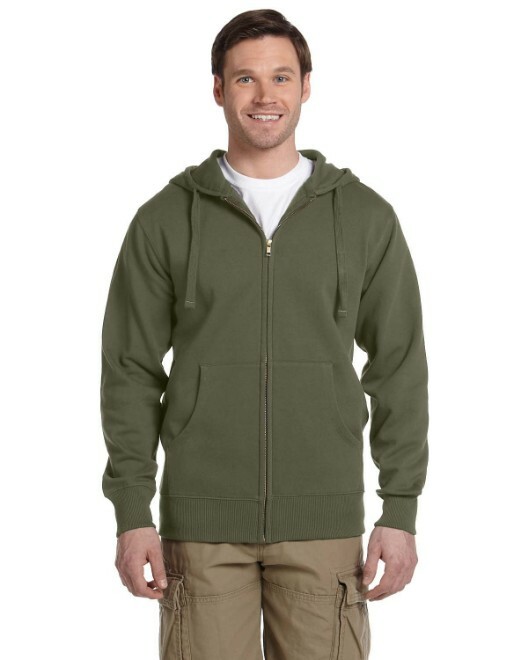 Another example of an eco-friendly article of clothing is the econscious EC5650 Men's Organic/Recycled Full-Zip Hoodie. 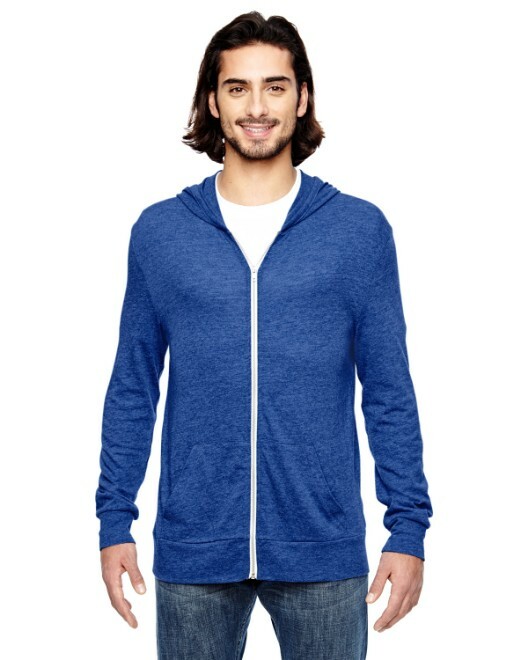 This hoodie is also made up of recycled poly and 80 percent certified organic cotton. For those that feel the desire to limit their impact on the environment, the eco-friendly route may be the way to go, especially when ordering in large quantities. 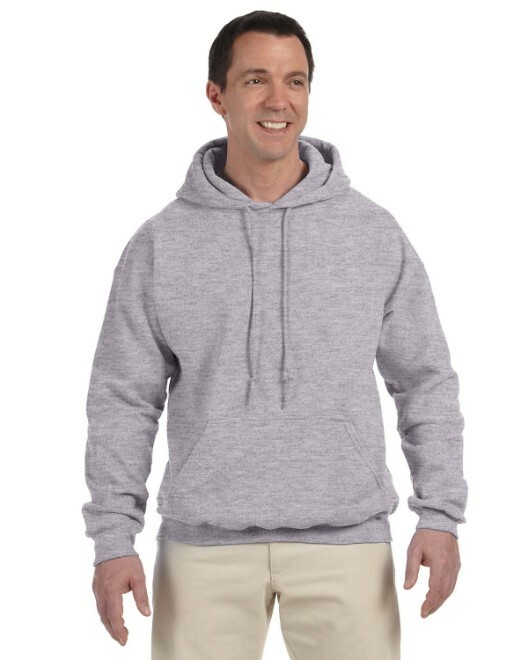 Select organizations may want it to be known that they are environmentally conscious, and may do so when printing their logos on these eco-friendly hoodies. Some may want a more distinct hoodie, one that catches the eye. Those options are available! 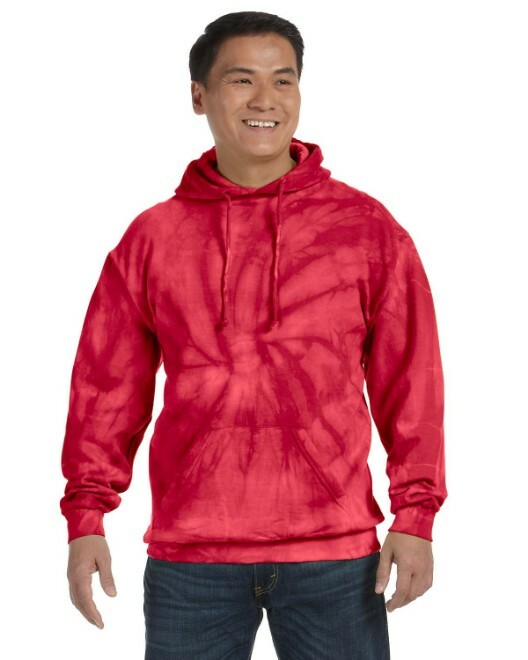 One fun option is the Tie-Dye CD877 100% Cotton Tie-Dyed Hoodie. With a variety of colors and designs available for all tastes, from “Spider Black” to “Reactive Rainbow”, these eye-catching hoodies are definitely distinct, and serve the purpose of drawing attention to any design or logo. Another great hoodie is the Code V 3969 Camouflage Hoodie. This sweatshirt is tailor-made for the avid hunter, as well as the stylish. It goes great with both rural and urban settings, and really makes a statement about team unity for the weekend warrior involved in team sports. Imagine a squad of teammates arriving to a game or match as the rival squad gets an eyeful of what they are up against. Talk about intimidation! This hoodie works especially well for paintball games, giving players the discreet advantage they seek on the path to victory. Looking for something for your little sportsman or sports girl? 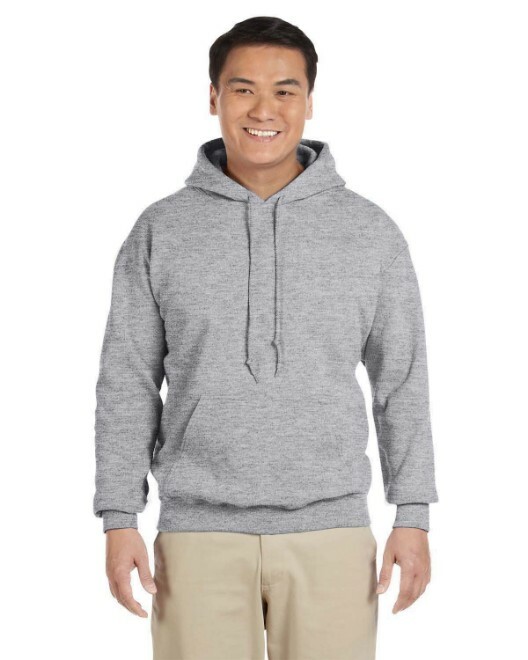 Both the Jerzees 993B Youth 8 oz., 50/50 NuBlend Full-Zip Hoodie and the Gildan G186B Youth 7.75 oz., 50/50 Heavy Blend Full-Zip Hoodie have got you covered (and your little ones too). Combining comfort and warmth with style, these hoodies are perfect for bringing the kids along on your weekend adventures, or to their own sports endeavors on a nippy day. Nothing makes a parent more proud than to see their kids functioning as a team unit, and looking the part too, than a squad full of teens with matching hoodies emblazoned with the team logo. Children will always wear that sweatshirt with pride, as it will serve as a reminder of those team values and sportsmanship that parents wish to instill in their kids when they sign them up for football, baseball, field hockey, or soccer. That’s the goal, after all! Oh, and of course we have the Code V 2969 Youth Camouflage Hoodie available for kids too, perfect for the junior extreme sports fan, from skateboarding and motocross to the little mixed martial arts fan. Ladies, feeling left out? Fear not. We’ve got you covered. 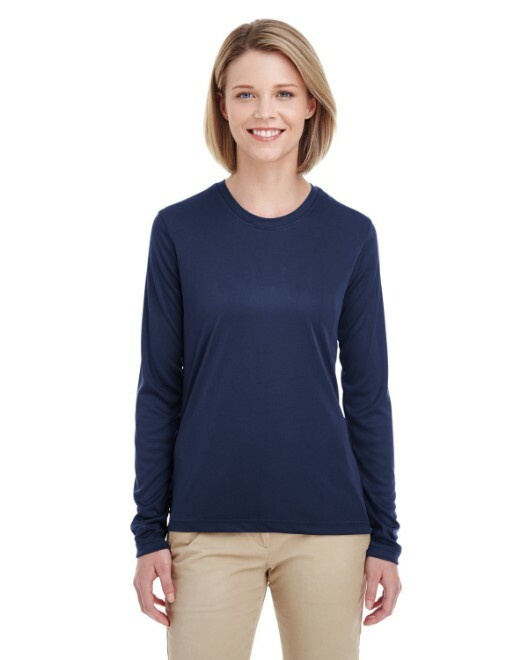 The LA T Sportswear 3654 Women's French Terry V-Neck Hoodie is sleek and stylish, not to mention comfortable, for that relaxed-but-fashionable look. These hoodies are perfect for today’s soccer mom, or bruising roller derby girl (especially if you’re both)! We also have our ecofriendly econscious EC4501 Women's Organic/Recycled Full-Zip Hoodie for the mothers who worry about mother earth. And parents, let’s not forget about our daughters. We also have the Bella 9007 Girl's 7.5 oz. Full-Zip Hoodie, perfect for the traditional girls on the way to cheerleading of gymnastics, or the more daring girls who go hiking or like to dominate on the basketball court. Of course, they’re also perfect for less extreme activities like lounging about comfortably on the weekends with mom and dad. Well, we’ve covered almost every aspect of hoodies there is. There is a great hoodie for everyone, and almost every occasion. They function professionally at work functions and the outdoors. They are great for sports and team-building purposes. They can provide a sense of unity, as well as comfort. They can be very fashionable too, as we offer an assortment of patterns and styles. They are perfect for an assortment of decals, from sports and corporate logos, to advertisements and sponsorships. They are perfect for both kids and adults, and they can make a bold statement, or, no statement at all. They can also simply provide the comfort we all seek. Enjoy!